A failing local bank, Amcore Bank, NA, filed a motion to appoint a Receiver to preserve the asset value of a 12-story historic office building located in the Bucktown neighborhood of Chicago. The asset went into foreclosure as a result of a failed hotel redevelopment plan and multiple building code violations. 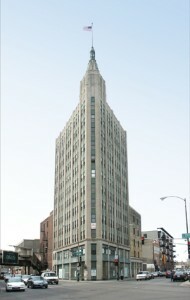 The Property entered Receivership under the jurisdiction of the Chancery Division of the Cook County Circuit Court for the purpose of: 1) collection of rents to fund operations, 2) leasing vacant spaces, and 3) researching prior Real Estate Tax delinquencies and appealing current Real Estate Tax assessments. Complicating matters, the Property was already under a separate receivership in the Municipal Court for building code and life safety violations. The Property is a 42,000 square foot, functionally obsolete office building situated on a 3,552 square foot corner lot. Directly adjacent to the north are two additional parcels that are part of the development project but not part of the Receivership. The Property is located in a rapidly gentrifying neighborhood, on one of the busiest pedestrian intersections in the entire Chicago metro area. The Property was less than 50% occupied at the time of the appointment. The Receiver oversaw and approved short-term leases that brought the occupancy level to 75%. The Receiver conducted in-depth research on the Real Estate Tax liabilities and uncovered an obsolete PIN with unpaid taxes that were sold to a tax certificate buyer. The certificate was near maturity, and the certificate holder would have the right to obtain the deed upon maturity. The Receiver secured the necessary funds and redeemed the certificate, which prevented the loss of the Property to the certificate holder. The Property is a high-rise structure with significant façade deferred maintenance. The City of Chicago Municipal Court (Building Court) appointed a Limited Receiver to address the hazardous conditions prior to the appointment of John Suzuki as General Receiver in Chancery Court. In order to save costs related to the Municipal Court case, the judge approved actions to be conducted by John Suzuki, the Receiver in the Chancery Court case, such as inspections and repairs to the window systems.